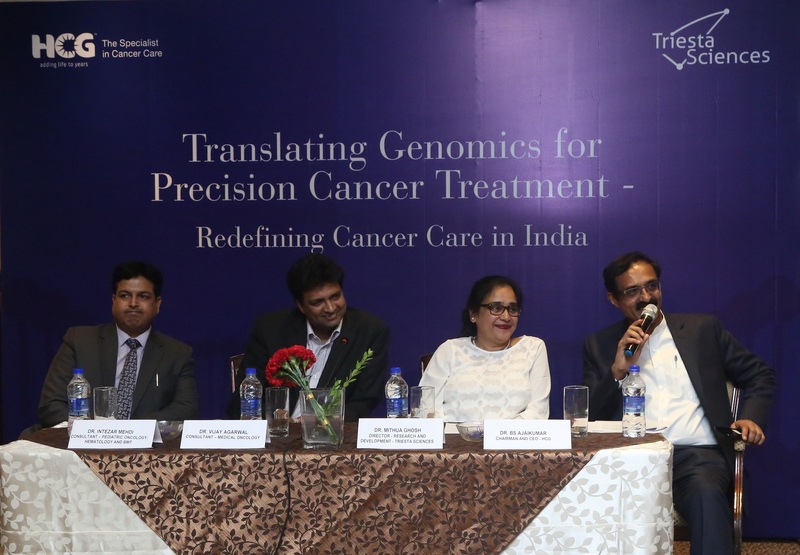 Envisioned to define the future of cancer care in India, Healthcare Global Enterprises Ltd. - The Specialist in Cancer Care today inaugurated the Triesta Genomics and Translational Research Center. It is a state-of-the-art Genomics Center offering comprehensive diagnosis by leveraging the latest and innovative technologies like Next-Generation Sequencing to all patients. Triesta Genomics and Translational Research Center will support an emerging medical discipline called Genomic Medicine that involves usage of genomic data of patients for better diagnosis. These will help in making therapeutic decisions more effective and help improve health outcomes for patients. With the largest patient base in private cancer care, HCG - Triesta Genomics and Translational Research Center stands on a strong foundation based on their access to the availability of well-annotated tissue biorepository, clinical data along with a strong clinical excellence of oncologists and scientists. The aim is to aid oncologists in their relentless pursuit to deliver personalized medicine using the genetic data of patients for better diagnosis at the very first time and achieve overall improved health outcomes. The center has also partnered with Strand Life Sciences for clinical informatics. The wealth of data emerging from cancer genome studies will be integrated with patients’ medical histories and clinical data using predictive and big data analytics. This “Genomics Data Bank” can lead to a better understanding of Indian population genetics and help develop more tailored approaches to predict treatment response in patients. With this launch, HCG has revolutionized cancer treatment, making it accessible for all patients to focus on improved outcomes. Healthcare Global Enterprises Ltd. (HCG), headquartered in Bangalore, is the largest provider of cancer care in India. Through its network of 19 comprehensive cancer centers spread across India, HCG has brought advanced cancer care to the doorstep of millions of people. HCG’s comprehensive cancer centers provide expertise and the latest technologies in diagnosis and treatment of cancer under one roof. HCG has pioneered the introduction and adoption of several technologies in the country including stereotactic radiosurgery, robotic radiosurgery and now using genomics for personalized treatment of cancer. The Triesta Genomics and Translational Research, a unit of Healthcare Global Enterprises Ltd. (HCG) is the one point, state-of-the-art solution for Cancer Diagnostics, Genomics (Next-Generation Sequencing based diagnostics), Biomarker and Translational Research, Laboratory services and Clinical Research Services. Based out of Bangalore, Triesta Sciences is an integration of Laboratory services, Research and Development, Biorepository, and Clinical Research with a focus on innovation, quality and accuracy for better diagnosis and prognosis of Cancer.